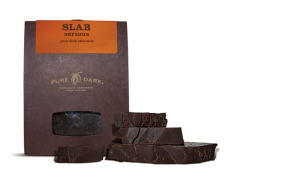 Also delicious is the Slab: 70 percent dark chocolate Slab with roasted and caramelized cacao nibs. It’s chunky goodness with a crunch. Granted, I wouldn’t eat more than a few bites at a time because it’s intense. A good intense, mind you, but a lot of a good thing is still a lot. It’s perfectly satisfying as a few bites here and there. Believe me, you will come back to it. It’s some of the best dark chocolate I’ve tried. For the dark chocolate blueberries, I got a little creative. They are good on their own, but the predominant flavor is more blueberry than chocolate. Which led me to wonder if they would be worth trying in Sunday morning pancakes. Come to find out, that was the best idea I had that day (it was a slow, non-taxing day). What I was really surprised by was even in the hot pancakes, the chocolate remained on the blueberry. Cooking them didn’t melt the chocolate leaving just a blueberry pancake. Instead, I ended up with pancakes dotted with chocolate covered blueberries! This was all the evidence I needed to recognize the holy union of fruit and chocolate- may they never be torn asunder. So if you really want to try dark chocolate, give Pure Dark a try. Drop by the website or if you’re ever in New York , I highly recommend a jaunt to one of The Food Emporium stores where Pure Dark can be obtained. It will be worth it. Pure Dark gets top rating from me of five BonBons!